Millennium 7 Publishing Co.: YOUR Augmented Reality Social Media Marketing? 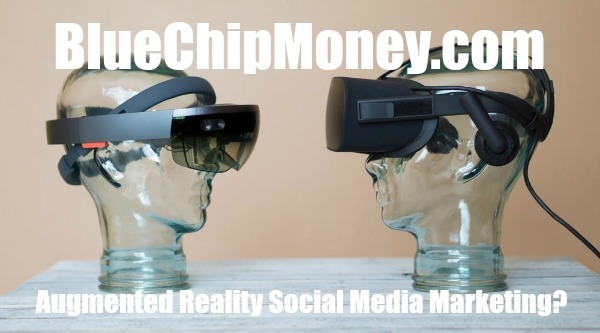 YOUR Augmented Reality Social Media Marketing? Augmented reality (AR) is already impacting social media – and its done so for years now. In fact, it seems like AR is taking over the most popular social networks in the world. Facebook, Instagram, Snapchat – and new AR technology is introduced all the time. The big question is though, how will it continue to impact social media? Brands and marketers in particular need to know these answers if they are going to be at the forefront of AR in social media and find new ways to boost their sales. So, is augmented reality the future of social media? And how will it affect brands and marketers? Augmented reality is often confused with virtual reality, but the two are quite different technologies. While sure, there are certain similarities, virtual reality implies creating a whole new world from scratch – a simulation of the real and the imagined world, whether it’s going back in time to walk with dinosaurs in realistic landscapes, or travelling to an imagined future where nothing feels familiar. Augmented reality on the other hand, takes the real world and projects virtual, computer-generated augmentations to it, in order to enhance our experiences. Like when you can see the world around you from your phone camera, along with Pokemons running around. Or when you take a picture of yourself with a virtual top hat and a moustache to share with your friends and followers. Or when a healthcare professional can better explain their work to their patients with interactive 3D projections. While many still see augmented reality as a means for harmless fun, whether it’s a cute little game or an exciting photo filter, the potential for this technology is absolutely amazing – it’s already disrupting numerous industries, including healthcare, education, navigation, manufacturing, marketing and so many more. And, of course, it will continue to do so at a very rapid rate as the technology evolves and it becomes more accessible. When it comes to social media, it’s already quite clear that AR and social work very well together. The question is, how will this change in the future? Will AR have an even bigger impact on social media as AR evolves? Even more so…is AR the future of social media? --Snapchat users can bring life to their updates with AR filters and lenses, and they can even create their own. --Snapchat users can play games with other users and friends with Snappables, which are essentially AR selfie games. --You can turn yourself into a 3D Bitmoji and insert yourself in the real world. --Plus, Snapchat recently released several features called Shoppable AR which allow brands to promote their websites and sign up pages, to share a video and to get people to install their apps. In other words, to give you a practical example, consumers can try out a brands’ products using a lens and then the retailer will be able to direct the consumers to where they can actually buy that product. Snapchat has found multiple ways to implement AR in ways that felt organic to its users, instead of forcing AR down people’s throats; and even if in the past year or so Snapchat has certainly had its share of issues and it’s still losing users, it’s not because of the AR technology that it is happening. In fact, it’s largely because other popular social networks like Instagram are adapting Snapchat's features to their own platforms. And it’s not just Instagram and Snapchat who are using AR to enhance the user experience, but Facebook too. In fact, the platform recently introduced the so-called Facebook AR Studio, a very powerful tool for developers and artists who want to build their own interactive Facebook camera experiences – and soon, they’ll also have access to other Facebook products like Instagram and Facebook Messenger. Related Article: Growing Social Media Trends? Will AR Take Over In The Future And How Will It Affect Other Brands? Considering how much AR is a part of social media today, the answer feels very obvious: augmented reality will continue to be a huge part of our everyday lives, including, of course, social media. --AR virtual stores on social media: consumers can already buy products via social media, but with AR, this could turn into a much more engaging experience. People won’t even have to visit a brands’ physical stores any longer – they’ll be able to step into your virtual store, try out your products and buy them directly online (it will be very interesting to see how many impulse purchases this will lead to! --AR videos: brands will be able to further engage their audiences by creating interactive AR videos; there are many different ways that they can use these videos, such as to show customers how to use their products or how to make the most of them. Or, if they’re selling a service of any kind, AR videos can help show people what the user experience would be like if they bought the service. --More brand awareness: a great AR experience is highly shareable. Meaning, if you create amazing AR experiences for your audience (such as lenses, games and other interactive AR experiences), people will want to share the results with their audience – this is incredible news for brands and marketers as it’s basically word-of-mouth and UGC (user generated content) on steroids. Guest Authored By Lilach Bullock. Lilach is an entrepreneur and passionate blogger for over a decade, during which time She has written thousands of articles on her blog and many other publications. Her Forbes column is all about helping businesses market themselves, whether entrepreneurs or start-ups, enterprises, and everything in between. If she's not blogging, she loves speaking at events all over the world, spending time with her daughter, and when time permits, she's also a big fan of Zumba. Follow Lilach on Twitter. "Augmented reality already is heavily linked to social media because of Snapchat and more recently, Instagram and Facebook. Plus, these top social networks are very much encouraging people to not only use their AR features as much as possible, but even to create their own AR experiences by giving the tools they need to build AR camera lenses and effects.